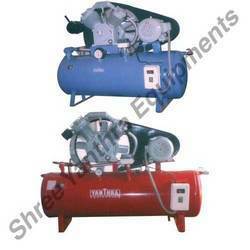 Shree Yanthra manufactures a complete range of reciprocating air compressors, for various applications in diverse industries, in different sectors such as CNC machine shops,sugar mills, paper mills, rice mills, food processing units and cement factories. Yanthra Reciprocation air compressors are designed for optimum efficiency with minimum maintenance, to meet satisfactory requirements of compressed air. Higher free air delivery at lower pressure for your specific requirement can also be offered and base mounted units can be supplied.these are also available at lower pressure to cater the specific requirements of the clients. We are engaged in manufacturing Industrial Air Compressor that are widely used in different sectors These air compressor are appreciated by the clients for optimum efficiency with minimum maintenance and for satisfactorily meeting the requirements of our clients. Offered with base mounted units.